Have you read the NYTimes Sunday magazine, “Losing Earth” by Nathaniel Rich, Sunday, August 1? That’s harsh, and distressing, but what can we say in the face of the evidence. A harsh indictment of us, and we as a species will be found guilty. Perhaps there would still be time if nations stopped carbon emissions, stopped cutting forests, required canopy trees in all large parking lots, required green roofs on new construction, banned factory farming of cows, chickens, and hogs, and banned single-use plastics, but they won’t, and there’s not much of that that we as individuals can control. Not much, but some. to restaurants for bringing leftovers home. Friends, this is important. Turning out your lights and taking shorter showers is not going to do it. We’ve all heard the oft-quoted aphorism that if you don’t vote, you don’t have the right to complain. I’ve never subscribed to that stance. But there is a parallel philosophy that is harder to dismiss. If we decry the hunger of 1 million people on this planet, and the trashing of the oceans and the destruction of the rain forests, the extinction of species and the wasting of water – and yet we choose to participate in the causes, do we have the right to decry? Or must we say, Well, I sort of care, a little bit, but not much – not enough to give up some of the pleasures I’m accustomed to. Learning How to Die in the Anthropocene, by Roy Scranton. The biggest problem climate change poses isn’t how the Department of Defense should plan for resource wars, or how we should put up sea walls to protect Alphabet City, or when we should evacuate Hoboken. It won’t be addressed by buying a Prius, signing a treaty, or turning off the air-conditioning. The biggest problem we face is a philosophical one: understanding that this civilization is already dead. Our leaders ignored the warnings while there was still time. And still, most of us are choosing, not from necessity but because we like the taste of other animals, to continue unraveling the web of life on this planet that we will leave to our children and grandchildren. We know that greenhouse gasses accumulate in the atmosphere and remain there for centuries as they are slowly absorbed by plants and oceans, and yet we continue the destruction of the rain forest, the lungs of the planet. There is much information about the connections between eating meat and climate change, some of it published by the Unitarian Universalist United Nations Office. Here is a 4-minute video that the UU UNO makes available on its website. It’s taken from this slightly longer (12 minute) video. While we are being encouraged to change our lightbulbs and drive hybrid cars, the united nations found that raising animals for human food contributes more to global warming than all the planes, cars, and trucks on the planet combined. Forty % more. You can leave your shower running for 24 hours a day every day of the year and you would still not waste as much water as when you include meat in your diet. Many of us recycle paper because we want to save trees. But the number one reason for cutting down trees, including the destruction of the rain forest, is to clear land for grazing meat animals and growing corn to feed to animals that we will slaughter and eat. 40,000 people on this planet starve to death every day! This does not happen because there is not enough food for everyone – this happens because, while people are starving, we are wasting enormous amounts of food to feed cows, pigs, chickens and other animals so that we can satisfy our desire (not need) for meat. Today, we look back on behaviors of humans in previous centuries and wonder how they could participate in some of the cruel practices common to the culture in early American history. Now, we persistently put our frivolous desires above the indisputable needs and rights of many who go hungry while we support a meat industry that metes out to us vastly more of the world’s resources than is our just portion. As we continue to eat animals even knowing that a vegetarian diet is healthier, and knowing that factory farming is the greatest contributor to water pollution and climate change, and knowing the pain and suffering inflicted on other sentient beings who want to live, I believe history will judge us harshly. Our local newspaper has recently published articles about industrial chicken farms around Pilot Mountain. These chicken farms are wrong on so many levels that it’s hard to focus on just one. chicken farms that pollute the land, air and water and destroy the value of area properties. Even more important, I think, than the injustice done to these individuals is the damage to our children and grandchildren who will have to deal with the environmental devastation caused by CAFOs (Confined Animal Feeding Operations). Since animal farms are the leading cause of deforestation, water consumption and pollution, this is an issue we should all care about. Pollution from chicken farms kills fish and other wildlife and makes people sick. And this does not even take into account the suffering of these sentient creatures who live their entire lives locked in cages so small they cannot spread their wings. I believe history will show that the way humans treat other animals is the major moral issue of our times. All going in the same direction, year after year. Proud they stand, but they’re never heard to say, We were here first. Perhaps repeating the tales of their ancestors, cut by the Spaniards to make bayonets. In West Palm Beach, the morning is warm. I walk around the lake and fall painfully in love with the Muscovy ducks. Four Muscovies rest under a bottle brush tree. and one yellow chick trimmed in black. An egret stands apparently on the water. But with my cynical nature I suspect there is a rock just under the surface. Or a stump. A stump would do. while someone’s grandchild tosses pinches of white bread into the water. There are tears. There are tears. 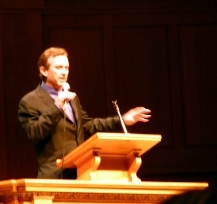 We went to see Robert F. Kennedy Jr. last week. The Yadkin Riverkeeper sponsored Mr. Kennedy’s visit to WFU, and he was the best, most enthusiastic, knowledgeable, and entertaining speaker I’ve heard in a long time. I had pen but not paper, so I took notes in the tiny white spaces around a tri-fold Honda ad. Kennedy, an environmental lawyer and activist, called for a major government investment in a smart grid to deliver wind-turbine and solar energy to homes nationwide and free the U.S. economy from its dependence on Middle East oil. The United States is rich with clean energy resources, from geothermal heat in the Midwest to wind farms in Montana, Texas and North Dakota to solar energy in the Southwest, he said. Kennedy advocated a transition from a carbon-based economy to one powered by solar and wind, saying clean energy is key to our economic and national security. He spoke of the wind farms in the Great Plains and Midwest states, and solar power fields in the sunny Southwest, such as the Nevada desert, saying they could provide all the electricity needed for every building and vehicle in the U.S., and said there is enough wind in just North Dakota, Kansas, and Texas to meet all of the country’s electricity needs. In a true free market, solar would out-compete coal, oil, and nuclear, but our marketplace is rigged by polluters. When coal claims to produce electricity at 11 cents per kilowatt hour, it’s not counting the $345 billion/year tax subsidies and it’s not counting the tremendous environmental pollution that taxpayers pay to clean up. It’s always been illegal to pollute, he said, citing the 1888 Rivers and Harbors Act. In the 17th c people were executed for polluting the commons. Kennedy was erudite, but his message was sobering. We can’t count on our representatives in Raleigh, or in Washington. Currently, he said, “we have a marketplace with rules written by polluters.” He cited several specific examples, including political interference in 2007 by J. Stephen Griles, then deputy secretary of the Department of the Interior and a former lobbyist for the National Mining Association, who managed to change the definition of the word “fill” instead of preventing the coal companies from contaminating rivers with their mountain-top removal fill. Kennedy talked about electric cars, which he said cost about 6 cents mile and are becoming more affordable, and he spoke with some optimism of Vantage Point Switch bulbs. These were not new ideas (I already have some of the expensive Philips LED bulbs in lamps), but his enthusiasm made it all seem new, and he added fine details that were new to me. He talked about Liquid Robotics – robots that move across the ocean at about 1 1/2 knots, powered by underwater wings. Looking something like window blinds, the wings tilt up when the craft is lifted by a wave, rising through the water and pulling it forward. On a down wave, the wings sink and tilt downward, pulling the craft forward. Leaving the auditorium, I had the fleeting thought that it would be good for Kennedy to follow the footsteps of his uncles into public office, into the White House, but on second thought, he is probably doing more good where he is, defending the environment against industrial polluters. We have a pigeon on our roof. 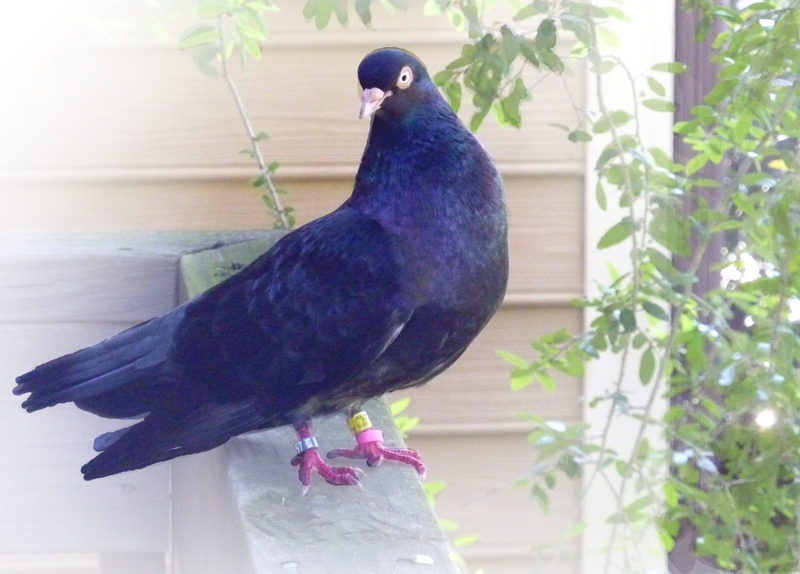 A black pigeon wearing ID tags. Bucky was the first to notice. It was walking back an forth along the edge, looking down on us as we sat on the porch reading and talking. We were all intrigued that it did not appear to be afraid of us. Not that we’re a scary bunch, but birds in the wild are supposed to think we are. We all thought this was a fleeting moment and that the bird would be gone before I could get my camera, but this bird likes to pose. We decided it’s a black dove. Sounds better than pigeon. Bucky held out a handful of safflower seeds, and the dove came right down and settled on the porch rail. We all went out to dinner, and were somewhat surprised when we returned and Black Dove was still there. We sprinkled some cracked corn on the rail, where we feed the songbirds. 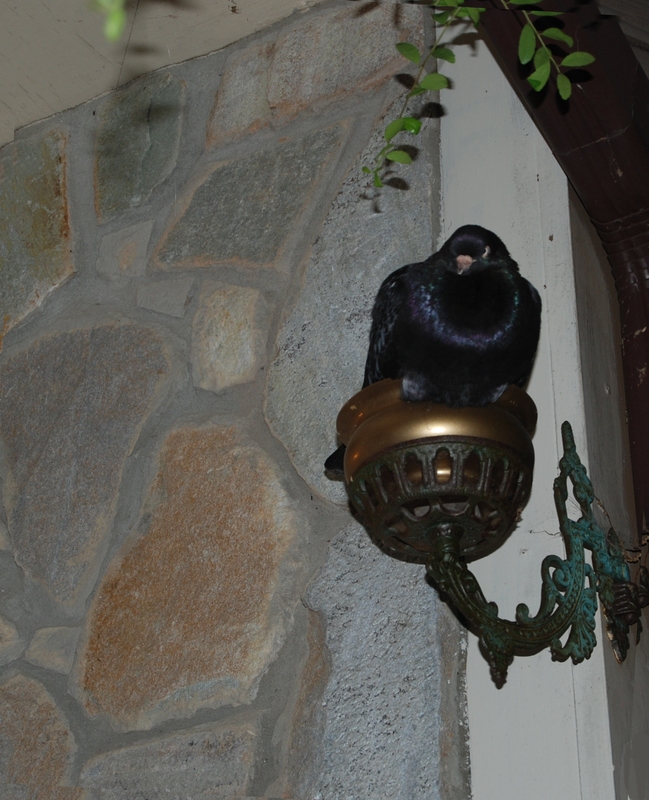 We have a flower pot attached to the wall, and the black dove has decided that’s a good place to settle in for the night. Since the dove is wearing bands on its legs, we thought we should try to get Black Dove back to his/her caretakers. 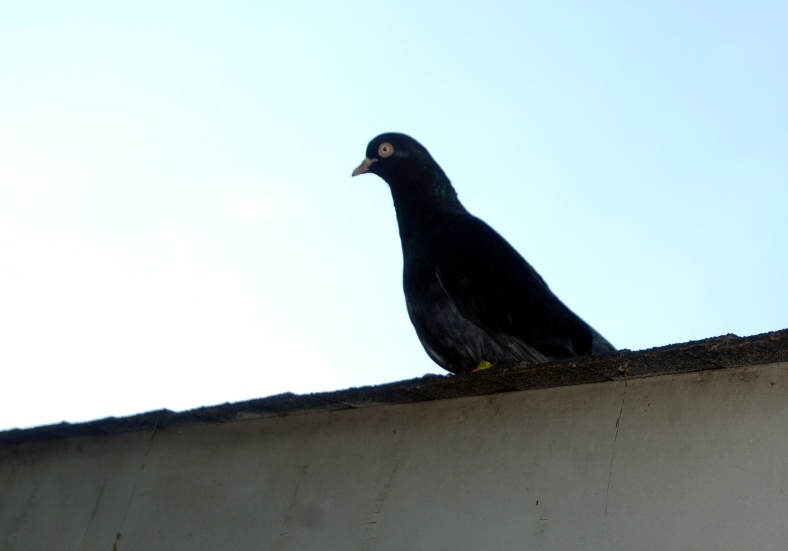 Might this be a scientific research pigeon, or does it belong to a local pigeon club? I called the local Audubon society, and learned that this pigeon is not working for science. It is a carrier pigeon. I wish I had asked what carrier pigeons carry these days, but I didn’t think to ask. I also learned that its likely the owner may not want it back. Because it will now be seen as unreliable. If it does get back to its home, I was told, the owner would likely just “put it to sleep”. That settles it. I won’t try to trace the numbers on the tags. I guess we have a pigeon on our roof. Winston-Salem doesn’t have a strictly vegetarian or vegan restaurant, as far a I know, since the closing of The Grilled Asparagus (and not for lack of business!). But there are many good restaurants that offer good vegetarian entres. Here are some that I happen to be familiar with. My favorite places are marked with *. This will mean nothing to you unless you know what sorts of places I prefer. Let me know of places I’ve missed. *Vincinzo’s, 3449 Robinhood Road— my favorite at this family-owned Italian restaurant is the spinach ravioli. My husband loves the eggplant parmigiana. The pasta primavera is also good. Music is quiet, for easy conversation. Booths are comfortable, staff is attentive. Providence Restaurant, 5790 University Pkwy, 27105. A few vegetarian entres on menu, and daily specials. Very good food, good service. All proceeds, as well as additional donations made in lieu of tips, provide support for the program Second Harvest Food Bank. Ichiban, in Thruway Shopping Center, has very good vegetables tempura. *Elizabeth’s, Hanes Mall Blvd. — spaghetti with marinara is wonderful. Egglant parmesan pretty good, and pasta primavera. Music is not too loud. Comfortable if you can get a booth. *Golden India — lots of vegetarian entres. My favorites are malai kofta, navratan curry. Quiet Indian background music makes for easy conversation. Attentive staff. Senor Bravo, corner of Marshall and Brookstown. — Chile rellenos, chile poblanos, cheese enchiladas. Good service. *Amazing Thai – Reynolda Manor. Almost all the dishes are offered with either fish or tofu. I especially like the panan curry. Pad Woonsen: Stir fried glass (clear) noodle with mushrooms, carrots, baby corn and scallions in a delicious sauce with tofu. *West End Cafe, 4th Street — veggie burgers, portobello sandwich, veggie pita. Really really good vegetarian reuben sandwich. Salmon filet in a spicy pecan crust w/ horseradish sauce- w/ pasta & veggies; White bean cake w/ tomato sauce. Menu changes, but I’ve always found something good without meat. Honey Pot – Fourth St. — not entirely vegetarian, but lots of delicious — really! — vegetarian dishes to choose from. I’ve had the falafel over couscous, and the Farmer’s Plate, which on the day I was there was bok choy, cooked not too much, several other vegetables, served with a warm and delicious carrot sauce (mostly pureed carrots). Diamond Back Grill, 751 N. Avalon Road –Vegetarian black bean burrito, tomato pie, enough sides to put together a vegetable plate. Lighthouse Restaurant, Burke Street– Soups, salads, or put together a vegetable plate. Great crabcakes, bleu cheese dressing. Breakfast of Course, 723 Trade St. 336-725-5764 — omelets with tofu, tempeh; vegetarian sausage, a vegan burger, or choose items for a sandwich from a fairly long list. Mellow Mushroom: 314 W. Fourth St. – 245-2820 Offers vegan and vegetarian pizzas and sandwiches. Pizza dough, which is also used for pretzels, is vegan. Mizu Japanese restaurant– 3374 Robinhood Rd, Winston-Salem, NC 27106, good food, nice quiet music. The Mizu salad (greens, avocados, pecans, etc.) is delicious and filing enough to be the entire lunch. For thoughts on the virtues of plant-based eating, see my post “Planet Care” and consider that we are destroying our planet as we turn our rain forests into grazing land for cattle. And consider the unbearable fear and pain endured by the animals that are raised in misery and then slaughtered in terror so that human animals can eat them. We cannot eliminate suffering from this world, but we should not contribute to it unnecessarily, and factory farming of animals for meat is an unnecessary cruelty. and so we both printed a copy of this to read. Bob was reading it when I fell asleep, so he will likely send you comments today too, comments more philosophically sophisticated than mine. The article is interesting for sure, and some of his comments about animal cruelty at the hands of humans seem, surprisingly, new to me. Surprisingly because when I read them they seem obvious. I do not believe the author is serious in his suggestion that we might try to eliminate carnivores from the planet.